Foods that lower blood sugar naturally white mulberry fruit White mulberry fruit can be eaten as a dried fruit or else taken as a leaf powder capsule. 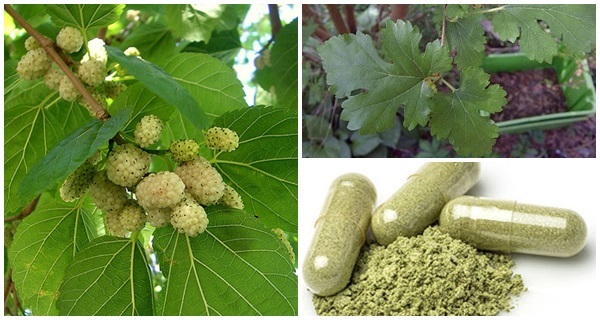 The biology behind white mulberry fruit. There are multiple health problems that arise when our body processes too much sugar (obesity, diabetes, inflammation). If a natural remedy can eliminate the excess sugar in our bloodstream, then that is certainly important news. Recent studies have shown that eating an extract of white mulberry does in fact help the body process sugar. In summary, there are chemical compounds in the white mulberry plant that prevent big spikes of sugar in our bloodstream after we eat a meal. One compound in particular, DNJ (see below), has the ability to eliminate excess sugar from our blood. This is good news for all people concerned with blood-sugar levels and obesity, but it is especially helpful for those suffering from diabetes.